How Long Should A Blog Post Be? Three Best Practice Questions Answered. How long should blogs be? How frequently should you post? We explored HubSpot, BuzzSumo, and our own data to find the answers. Effective Inbound marketing campaigns are based around regular blogging. Why? Because a healthy company blog - full of relevant, educational content that speaks to buyer persona’s key challenges - is one of the best methods of attracting relevant new visitors to your website. But what blogging best practices yield the best results? How long should blogs be? 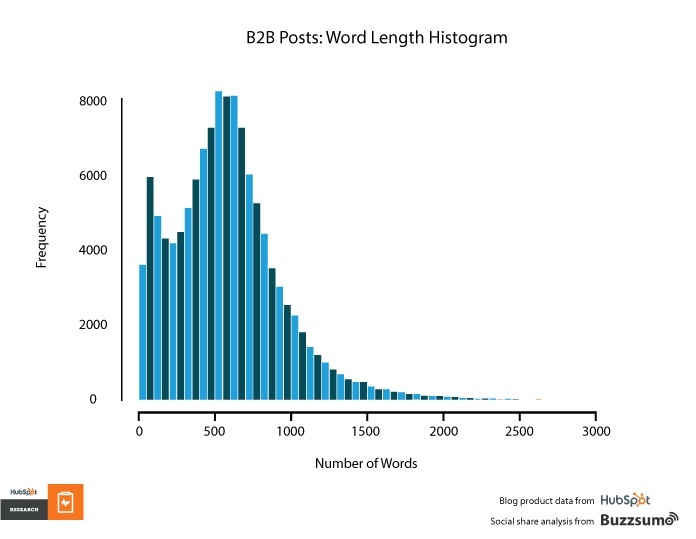 How many words do average B2B blogs contain? What impact does word length have on social shares? And how frequently should a B2B business blog to see results? To find out, we explored a combination of HubSpot research and our own case study data. How Long Should A B2B Blog Be? First off, how long should your B2B blogs be? Between 500-1000 words is a typically common and recommended length for blogs. The most frequent blogs averaged around 600 words in length. Interestingly, a lot of posts (c.6000) were around 100 words long. These posts were likely to be video or image based, so length would only account for supporting text. Longer form content (1000+) is produced less frequently. Possibly this is because very long, detailed content may be better placed as a gated content offer - an eBook, whitepaper or guide - or has been split into a series of shorter blogs, making up a content hub. How Long Should A Blog Post Be To Gain Social Traction? Generally if you’re hoping to optimise word count for dramatically increased social shares, the length of your blog shouldn’t have too much impact. 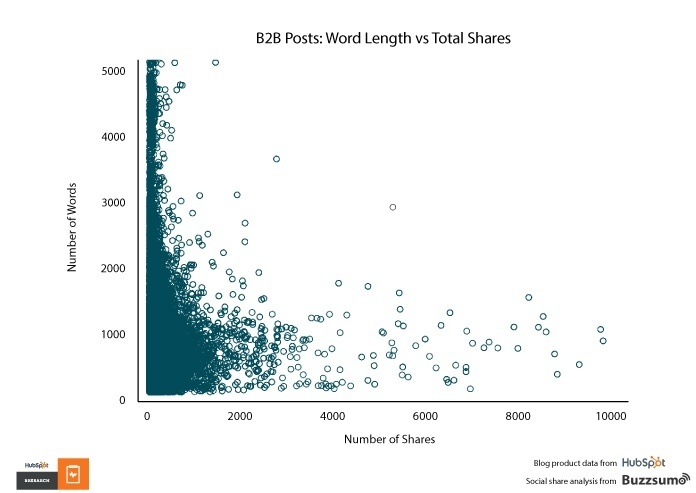 In the chart above from BuzzSumo and HubSpot’s ‘B2B vs B2C Content Lessons’ report, it can be seen that there is not much correlation between post length (word count) and any high volume of social shares for B2B blogs, though posts of 0 - 1000 words are typically shared more. This is likely because posts between that word count range are more common, and with concise, relevant posts being more reader friendly. Regardless of word count, regularly promoting your blog content through your social channels will also help to increase social traction. According to Hubspot, companies who published more than 16 posts per month, saw traffic increase 3.5x more than those who only published up to 4 posts per month. The number of blog posts on our site grow from 6 to 181. A 1271% increase in traffic. Organic traffic grow from 143 sessions per month at the outset, to 1817 sessions per month in March 2016. It is important to note that all blog content was mapped to resonate with specific buyer persona challenges, and posted through relevant social media channels. Be regular: you should produce close to 16+ per month if possible. Generally stay around 500-800 words long (though variation is fine!). Your posts should also be written to address your persona’s common business challenges, and be regularly promoted via your own company social media channels. Quality, persona-targeted blog content can enhance search rank, boost traffic, attract higher quality leads and establish your brand as trusted niche expert. Time to get writing!